Veterinarians are seeing an increasing number of anaphylaxis patients because of the range of substances patients are exposed to, such as vaccines, new medications, and those from outdoor physical exposures3 (see Specific Causes of Anaphylaxis). However, anaphylaxis is often misdiagnosed because definitive criteria to distinguish anaphylaxis from an allergic reaction are lacking.10 This article reviews anaphylaxis pathophysiology, diagnostic criteria, treatment, and clinical examples. Hymenoptera is an order of insects that includes bees, wasps, and ants. The venom of each species has different effects in patients. Bees pose an anaphylactic threat because the venom in their stings contains peptide 401, phospholipase A2, melittin, and hyaluronidase. Peptide 401 is also known as mast cell–degranulating peptide and causes histamine release. Phospholipase A2 works with melittin to cause intravascular hemolysis. Hyaluronidase changes vascular permeability by disrupting collagen and allowing other venom components to penetrate cells. Melittin hydrolyzes cell membranes, thus altering permeability. It also causes biogenic amines and potassium to leak from cells and induces catecholamine release. Melittin is the primary cause for localized pain.4,5 A bee can only sting once because of the barbs on its stinger. Other common causes of anaphylactic reactions include ophthalmic antibiotic ointment (in cats), drugs (some chemotherapy agents, contrast material, and antibiotics), and blood transfusions. Figure 1. Effect of mast cell degranulation.11 GI, gastrointestinal. Heparin is also released from mast cell granules. The release of heparin inhibits clot formation by decreasing clotting factors.13 This may lead to a hypocoagulable state and predispose a patient to clinical bleeding. Prostaglandins released may cause bronchoconstriction, pulmonary and coronary vasoconstriction, and peripheral vasodilation.14 Clinically, airway obstruction, increased airway secretions, and decreased cardiac output may be noted (hypotension). Platelet activating factor decreases coronary blood flow and myocardial contractility and increases pulmonary resistance, vasodilation, hypotension, and platelet aggregation.13,14 Decreases in myocardial contractility in conjunction with vasodilation can lead to profound hypotension. Cutaneous signs are the most common initial clinical sign of an allergic reaction but may be a precursor for more severe reactions, such as anaphylaxis. If severe anaphylaxis has a rapidly acute onset, cutaneous signs may be absent. The most common cutaneous clinical signs include erythema, urticaria, pruritus, wheals, and angioedema. These signs are often short in duration. Respiratory signs often result from laryngeal and pharyngeal edema, bronchoconstriction, and increased mucus secretion. They include dyspnea, bronchospasm, stridor, tachypnea, and coughing. Because of the intensity of vasodilation during anaphylaxis, hypotension is the primary cardiovascular sign. Hypotension is further exacerbated by fluid extravasation as vascular permeability increases; intravascular blood volume can decrease up to 35%, leading to both a hypovolemic and a distributive shock state.15 Tachycardia due to hypovolemia may also be present in anaphylaxis patients. Conversely, bradycardia may be caused by increased vagal reactivity. Careful auscultation may reveal cardiac arrhythmias. Signs of decreased perfusion may exist, including pale mucous membranes, increased capillary refill time, decreased pulses, hypothermia, and depressed mentation. Because of vasodilation, injected or “brick red” mucous membranes may be noted on physical examination. Cutaneous signs, such as urticaria, erythema, angioedema of the face and muzzle, hypersalivation, and pruritus, can be seen but may be subtle and short lived.2 Hemorrhagic enteritis caused by portal hypertension is one of the most commonly noted clinical antemortem signs as visceral pooling of blood in the intestines increases, leading to vomiting and diarrhea.12,16 As a result of the degree of liver involvement, dogs typically exhibit signs of cardiovascular impairment due to hepatic venous congestion. Other common clinical signs include hypotension and cardiovascular collapse; dyspnea, bronchospasm, and stridor may be noted as well. Cats typically exhibit respiratory and gastrointestinal signs. Respiratory distress is often the first sign exhibited. Cats’ clinical signs may also include hypersalivation, laryngeal swelling, edema, pruritus, and signs of hypovolemic shock.12,16 Cats are less likely than dogs to experience cutaneous effects. Anaphylaxis may be difficult to diagnose and is often overlooked. Diagnostic differentials include severe asthma, a vasovagal event, and neoplasia, such as a pheochromocytoma or mast cell tumor degranulation.10 Rate of onset of clinical signs is an important diagnostic criterion. Anaphylaxis usually occurs within the first 30 minutes after allergen exposure and progressively worsens. However, a general rule of thumb is that the more quickly the signs manifest, the more severe the anaphylaxis will be. Box 1 presents criteria that can be used to assess the likelihood of anaphylaxis in a presenting patient. Clinical signs sometimes subside and acutely reappear after several hours. These are known as biphasic reactions and can increase mortality if they are not recognized and treated appropriately.18 Obtaining a detailed history about past allergic reactions, vaccinations, outside exposure, and previous medical ailments can be an important tool in diagnosing anaphylaxis. Anaphylaxis is highly likely when any 1 of the following 3 criteria are fulfilled. If the patient presents in respiratory distress, it may be necessary to secure an airway. An endotracheal tube may be placed for patients with laryngeal swelling. If an endotracheal tube is not feasible because of swelling, a temporary tracheostomy tube may be placed surgically. Albuterol (a β-agonist) may help cause bronchodilation and decrease bronchospasm. Doses for all drugs discussed below are listed in Box 2. Epinephrine may be administered via the endotracheal tube; via SC, IM, or IV routes; or as a continuous-rate infusion (CRI). Current recommendations state that an initial dose of epinephrine may be administered IM. This can be repeated every 5 to 15 minutes.19 For the fastest and most profound effect, IV administration is recommended. If shock has developed, IV administration of epinephrine (bolus dose) followed by a CRI that can be titrated to effect is recommended.2,19 If IV epinephrine boluses appear to have little to no effect, a CRI may be started.20 Studies have shown that SC administration may provide a very delayed effect and is not recommended. Both H1 and H2 antihistamines act as inverse agonists, not competitive antagonists. Inverse agonists differ from competitive antagonists in that when they bind to the receptor, they induce an opposite response instead of simply not causing receptor activation. H1 antihistamines have a higher affinity for H1R and may act to stabilize the receptors. H1 antihistamines are most effective in treating localized allergic reactions and include diphenhydramine, chlorpheniramine, and cyproheptadine. H1 antihistamines cross the blood–brain barrier; therefore, they may cause central nervous system depression. H2 antihistamines include famotidine, ranitidine, and cimetidine. Studies have shown that use of H1 and H2 antihistamines together relieved cutaneous symptoms of anaphylaxis more effectively.20 However, these drugs should never be substituted for epinephrine during anaphylaxis. They should be used as ancillary treatments to help reduce some of the cutaneous and gastrointestinal signs. Albuterol, an inhaled β-adrenergic agonist, may be used to treat respiratory signs and to relieve bronchospasm. However, it does not replace the need for epinephrine because it has minimal α-adrenergic effect. Aminophylline, a phosphodiesterase inhibitor, may be useful for increasing amounts of cyclic adenosine monophosphate, which in turn increases the release of endogenous epinephrine and thus furthers the inhibition of mediator release.16 Aminophylline also directly relaxes smooth muscles in the bronchi and pulmonary vasculature. Volume resuscitation should be tailored to the patient’s clinical response. Improvement in perfusion parameters (mentation, mucous membrane color, capillary refill time), rectal temperature, heart rate, blood pressure, and lactate measurements can help determine whether resuscitation is adequate. In some cases, a more aggressive approach may be needed for treatment of anaphylaxis. Patients with severe hypotension and/or bradycardia that is unresponsive to epinephrine and fluid resuscitation should be treated symptomatically with vasopressors and/or anticholinergics. Use of vasopressors should be considered when epinephrine and fluid resuscitation fail to improve blood pressure. Vasopressors act to increase myocardial contractility and cause vasoconstriction.2,16 These effects may help to counteract the vasodilation and myocardial dysfunction that occur during an anaphylactic reaction. Patients experiencing anaphylactic shock should be hospitalized for an observational period of 48 to 72 hours.16 Organs involved in the initial reaction may quickly deteriorate and should be monitored closely. These organ systems can experience a secondary or biphasic response. Anaphylaxis is a severe condition that requires rapid emergency treatment. Because of the lack of definitive diagnostic criteria, it may be difficult to diagnose and is often overlooked. Rapid patient history and assessment are key in diagnosing and treating anaphylaxis. Kemp SF. 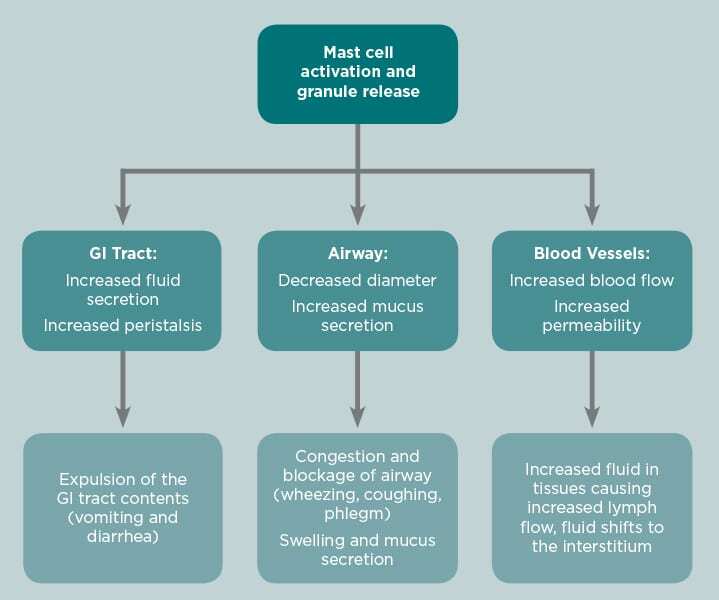 Anaphylaxis: current concepts in pathophysiology, diagnosis, and management. J Allergy Clin Immunol 2001;22(4):611-634. Simons FE. Anaphylaxis. J Allergy Clin Immunol 2008;121(2 Suppl):S402-S407. Kemp SF, Lockey RF. Anaphylaxis: a review of causes and mechanisms. J Allergy Clin Immunol 2002;110(3):341-348. Golden DB, Moffitt J, Nicklas RA, et al. 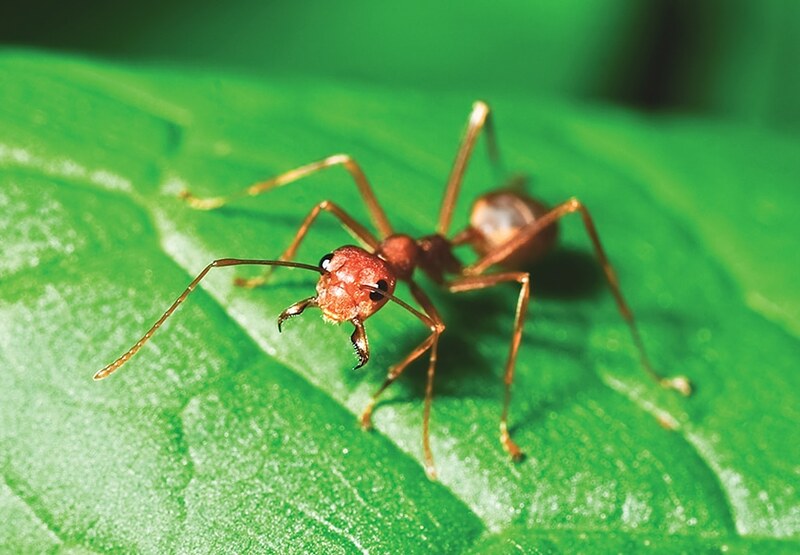 Stinging insect hypersensitivity: a practice parameter update 2011. J Allergy Clin Immunol 2011;127(4):852-854.e1-23. Cowell AK, Cowell RL, Tyler RD, Nieves MA. Severe systemic reactions to Hymenoptera stings in three dogs. JAVMA 1991;198(6):1014-1016. Mueller RS, Janda J, Jensen-Jarolim E, Rhyner C, Marti E. Allergens in veterinary medicine. Allergy 2016;71(1):27-35. Hume-Smith KM, Groth AD, Rishniw M, Walter-Grimm LA, Plunkett SJ, Maggs DJ. Anaphylactic events observed within 4 h of ocular application of an antibiotic-containing ophthalmic preparation: 61 cats (1993–2010). J Feline Med Surg 2011;13(10):744-751. Pollard RE, Pascoe PJ. Severe reaction to intravenous administration of an ionic iodinated contrast agent in two anesthetized dogs. JAVMA 2008;233(2):274-278. Gibson G. Transfusion medicine. In King LG, Boag A (eds): BSAVA Manual of Canine and Feline Critical Care. 2nd ed. Wiley; 2007:226. Johnson RF, Peebles RS. Anaphylactic shock: pathophysiology, recognition, and treatment. Semin Respir Crit Care Med 2004;25(6):695-703. Janeway CA, Travers P, Walport M, Shlomchik MJ. Immunobiology: The Immune System in Health and Disease. 6th ed. New York: Garland Science; 2004. Sampson HA, Muñoz-Furlong A, Campbell RL, et al. Second symposium on the definition and management of anaphylaxis: summary report—Second National Institute of Allergy and Infectious Disease/Food Allergy and Anaphylaxis Network symposium. J Allergy Clin Immunol 2006;117(2):391-397. Tucker A, Weir EK, Reeves TJ, Grover RF. Histamine H1 and H2 receptors in pulmonary and systemic vasculature of the dog. Am J Physiol 1975;229(4):1008-1013. Finkelman FD. Anaphylaxis: lessons from mouse models. J Allergy Clin Immunol 2007;120(3):506-515. Schadt JC, Ludbrook J. Hemodynamic and neurohumoral responses to acute hypovolemia in conscious mammals. Am J Physiol 1991;260(2 Pt 2):305-318. Lee JK, Vadas P. Anaphylaxis: mechanisms and management. Clin Exp Allergy 2011;41(7):923-938. Quantz JE, Miles MS, Reed AL, White GA. Evaluation of alanine transaminase and gallbladder wall abnormalities as biomarkers of anaphylaxis in canine hypersensitivity patients. J Vet Emerg Crit Care 2009;19(6):536-544. Stark BJ, Sullivan TJ. Biphasic and protracted anaphylaxis. J Allergy Clin Immunol 1986;78(1 Pt 1):76-83. Lieberman P. Use of epinephrine in the treatment of anaphylaxis. Curr Opin Allergy Clin Immunol 2003;3(4):313-318. Sheikh A, Ten Broek V, Brown SG, Simons FE. H1-antihistamines for the treatment of anaphylaxis: Cochrane systematic review. Allergy 2007;62(8):830-837. Choo KJ, Simons E, Sheikh A. Glucocorticoids for the treatment of anaphylaxis: Cochrane systematic review. Allergy 2010;65(10):1205-1211. Jennifer L. Lyons, MS, is a veterinary technician at BluePearl Veterinary Partners in Midvale, Utah. Before moving to Utah, she attended the University of California, Davis, for 6 years where she received a BS in animal biology and an MS in animal biology with a specialization in reproduction. Her interests include emergency triage, critical care, and endocrinology. Jordan R. Scherk, DVM, DACVECC, is a staff criticalist and the medical director of BluePearl Veterinary Partners in Midvale, Utah. He graduated from Western University of Health Sciences, completed an internship at VCA Veterinary Special Center of Seattle, and completed his residency training at the University of Georgia. His interests include trauma, acute kidney injury disease, cardiac critical care, cardiopulmonary resuscitation (CPR), and mechanical ventilation. He has lectured on CPR, congestive heart failure, and respiratory distress, as well as anaphylaxis. Upon finishing this article, readers will be able to define anaphylaxis and describe its mechanisms of action, list the chemical mediators involved, identify the different shock organs in different species, recognize clinical signs, and determine treatments for patients with anaphylactic shock. This article provides an overview of anaphylaxis; the pathophysiology of its mechanisms of action, including mediators and shock organs; and treatment recommendations for a variety of clinical signs associated with anaphylactic shock. The article you have read has been submitted for RACE approval for 1 hour of continuing education credit and will be opened for enrollment when approval has been received. To receive credit, take the approved test online at vetmedteam.com/tvp.aspx (CE fee of $5/article). Hepatic vascular resistance can increase to _____ of normal in dogs experiencing anaphylaxis. What drug may be useful for treating bronchoconstriction as well as inhibiting mediator release? Which type of reaction requires an initial allergen exposure? When should an epinephrine CRI be started? Which of the following receptors, when activated, causes an increase in nitric oxide production? Patients recovering from anaphylactic shock should undergo an observational period of ______ hours. Intravascular blood volume may be decreased by _____ due to fluid extravasation. What are the primary shock organs in the dog and cat, respectively? Which drug acts as both an α- and a β-adrenergic agonist? Note Questions online may differ from those here; answers are available once CE test is taken at vetmedteam.com/tvp.aspx. Tests are valid for 2 years from date of approval.